I have a shameful that secret I need to admit. Bloody Mary’s never made sense too me. Why would anyone want to drink tomato juice and vodka with the random olive or celery stick mixed in to garnish? 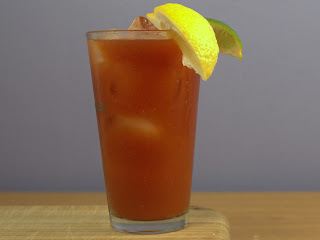 The idea of creating a Bloody Mary that makes sense to me seemed like a worthy challenge. I wanted to bring acidic and pungent elements into this cocktail so the sweet tomato juice wasn’t so one-dimensional. The juice from the lemon brightens up the cocktail. The pungent elements come from exploiting the heat of the capsaicin found in chili peppers and the pungent sulfur kick from raw garlic is due to allicin. These compounds have health benefits too, allicin is known to reduce blood pressure and helps reduce some forms of cancer while capsaicin potentially helps with weight loss, has potential preventative cancer properties, and can help relieve pain. (WebMD) Basically there’s a physiological reason that the burn feels so good and your body will end up thanking you. That being said, if you have a low tolerance to spice, start out by infusing a more mild pepper such as a Jalapeno which contains roughly 5,000 SHU to the Habanero’s 100,000-350,000 SHU. Pepper Scale is a great source for Scoville information. In order to load up this cocktail while avoiding chewing on raw garlic or catching habanero seeds in the back of the throat, we infuse the vodka with the raw chili and garlic then simply transfer and strain the infused vodka for a Bloody Mary or later use. So here it is, a Bloody Mary will put a kick in your step and fire in your belly. A perfect hair of the dog if you need a quick pick me up. Or a spicy drink to sip on during a cool night. Slice 1 habanero and 2 garlic cloves, put into a mason jar. 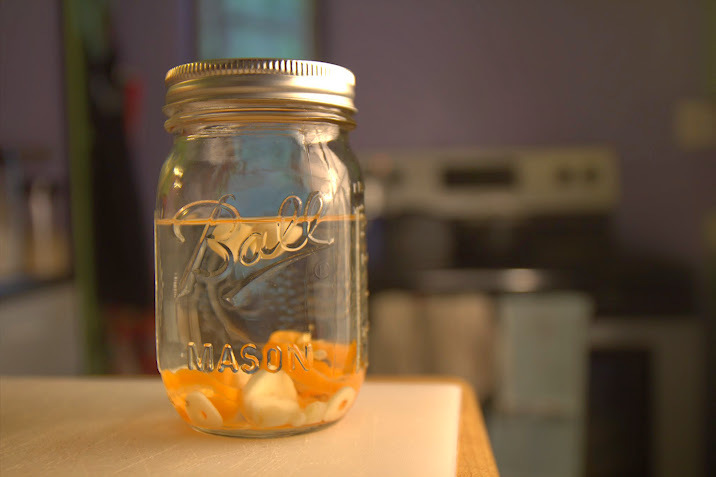 Pour vodka into the mason jar with habanero and garlic slices. Let sit for 4 hours, shake the mason jar once every hour. Add tomato juice, vodka, lemon juice, hot sauce, Worcestershire sauce, and spices into a cocktail shaker filled with Ice. Strain the Bloody Mary mix into the pint glass and enjoy. MacPherson, Lindsey J., Bernhard H. Geierstanger, Veena Vinswanath, Michael Bandell, and Samer R. Eid. "The Pungency of Garlic: Activation of TRPA1 and TRPV1 in Response to Allicin." Current Biology 15.10 (2005): 929-34. Print. Pepper Scale. N.p., n.d. Web. 7 July 2014. <http://www.pepperscale.com/>. WebMD. N.p., n.d. Web. 7 July 2014. <www.webmd.com>.